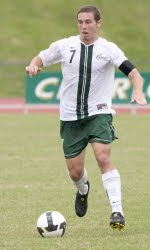 Charlotte 49ers senior midfielder Adam Gross was named to TopDrawerSoccer.com's National Team of the Week after his performance last weekend against George Washington and Richmond. Gross scored two goals including the game-winning goal and tallied two assists in the 49ers' Atlantic 10 Conference opening 6-0 win over George Washington last Friday. Then, he helped the 49ers record their third straight shutout when Charlotte tied Richmond, 0-0, in double overtime Sunday. Gross leads the 49ers and ranks second in the league with six assists. He is tied for second on the team with four goals.